The 2015 edition of ShowBoats magazine’s Global Order Book has just been published and, as usual, demonstrates that the Azimut Benetti group is the world’s largest builder with 79 projects currently in build totalling an extraordinary 2,555 metres. Here we select five fine Azimut Benetti superyachts currently listed for sale. The 60 metre Swan has exterior styling by Stefano Natucci and was built in steel and aluminium to ABS class and MCA coded with delivery in 2011. Formerly known as Lyana, her stunning, decorative interior by Pierre-Yves Rochon is in dark wood joinery and features a delightful central stairwell with an illuminated central pillar that rises through the decks. Accommodation is for 12 guests in six staterooms consisting of a full beam master suite, three double staterooms and two twin cabins. All staterooms come complete with entertainment centres and en suite bathroom facilities. Her extensive deck spaces are perfect for relaxing and entertaining, with chic alfresco dining and seating areas. The large sun deck has an eight-person Jacuzzi, outdoor bar, gym, and an abundance of sunpads and chill out areas. A custom disco lighting and sound system have also been installed on the sun deck, priming her for entertainment. 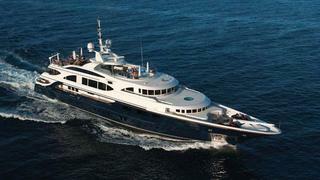 She is helicopter capable and includes a private beach club. Twin 1,850hp MTU engines give her a range of 5,000 nautical miles and she is fitted with Naiad zero speed stabilisers. 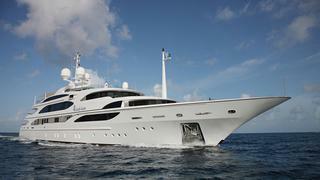 Marketed for sale by Fraser Yachts, Swan is asking €37 million. One of an acclaimed series of yachts from Benetti, the 60 metre Andreas L was designed by Stefano Natucci. She was built for an experienced owner to Lloyds class, is MCA coded and was delivered in 2008. Well-conceived, innovative interior design by Redman Whiteley Dixon results in a spacious, elegant vessel. Contemporary, elegant styling runs throughout the light and spacious interior while fantastic open decks, a vast Jacuzzi and excellent sun-lounging spaces provide a host of facilities for life outdoors. There is also a dedicated massage room. Accommodation is provided for 12 guests in six large, airy cabins configured as a master suite, VIP suite (convertible to twin), two doubles and two twins with additional Pullman berths in each. All staterooms are en suite and there is a fully integrated Kaleidescape on demand entertainment system and IPod docks. Twin 1,600hp Caterpillar engines give her a range of 4,500 nautical miles and she is fitted with zero speed stabilisers. Lying in the Genoa Airport marina in Genoa, Italy, Andreas L is asking €32 million through Burgess. The 60 metre St David was built to Lloyds class and was designed inside and out by Andrew Winch and delivered in 2008. 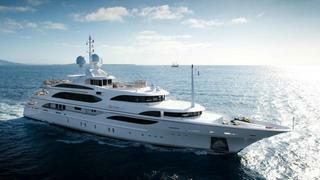 She went on to become a finalist at the 2009 World Superyacht Awards, and is featured in the 2010 edition of The Superyachts book. Low, streamlined and curvaceous, her exterior lines mirror the sleek profiles of Italian supercars. MCA compliant, her sumptuous interior sleeps 12 guests in six impressive staterooms including a split level master suite with a private lounge area, a VIP stateroom, two doubles and two twins, all with en suite bathroom facilities. Three decks offer multiple areas for exercise, relaxation and alfresco dining including a huge sun deck offering shaded areas for comfortable relaxation, a large pool, and a huge entertainment area with an outdoor cinema. At night, this entire deck can be transformed into a private night club. Twin 1,875hp Caterpillar engines give her an extensive range of 4,280 nautical miles at 12 knots. Dbeere Yachts have St David listed for sale asking €27.5 million. The 59.3 metre Lady Lara was built in steel and aluminium as a displacement yacht to a design by Stefano Natucci and was delivered in 2009. Studio Massari worked with design house Fendi to create an exquisite interior incorporating only the finest and most rare materials. Lady Lara accommodates up to 12 guests in six staterooms. She is an MCA compliant vessel built to Lloyd’s classification, with recent renovations including full paint work by Pinmar at the MB92 shipyard in Barcelona. A unique interior has created beautiful and luxurious living spaces throughout. Her full beam master suite situated on the main deck boasts an additional panoramic lounge area, while the remaining cabins consist of a VIP stateroom, three doubles and a twin, all with en suite bathroom facilities. The main saloon has soothing cream and beige upholstery, while gold finishes and mouldings give the space an extremely warm quality. An elevator within the yacht’s spiral staircase seamlessly connects each deck, and on the lower level a built-in sauna sits with direct access to a large swim platform. An outstanding sundeck is the highlight of her exceptional exterior spaces, providing guests on board with the ultimate in al fresco entertainment and dining areas. Other features include a large Jacuzzi and fully air-conditioned gym. Twin 1,770hp MTU engines power her to a cruising speed of 15 knots and a range of 6,142 nautical miles. 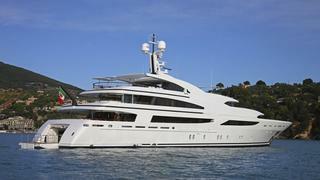 Lady Lara is asking €38 million with Y.CO. The 59.3 metre I Dynasty was built in steel and aluminium to a design by Stefano Natucci and was delivered in 2008 as a full displacement yacht built to ABS class. She recently completed a full repaint and extensive works at the Lusben facility in Livorno, Italy and is in immaculate condition. Accommodation is for up to 14 guests in six staterooms consisting of a master suite, VIP stateroom, two doubles and two twins with two Pullman berths. All staterooms have en suite facilities. The main saloon has a large seating area and dining section. Forward of this area, in the main foyer, there is an elevator that provides access to the lower guest cabins, to the gymnasium and to the sun deck. The sky lounge is located on the upper deck and includes a bar, games table, a large screen for movies and a raised seating area for relaxing. On the sun deck there is an air conditioned gym with a separate sauna. 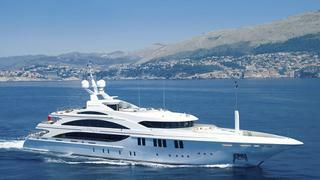 SuperyYachtsMonaco is offering I Dynasty for sale asking €36 million.